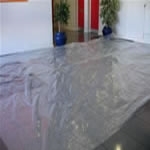 Polythene Dust Covers ideal for protecting carpets and floors, when moving in , or moving out. The polythene sheeting can also be used to wrap up large items such as rolled rugs, or carpets. Put the Dust Covers on the floor of your moving van to further protect your items.